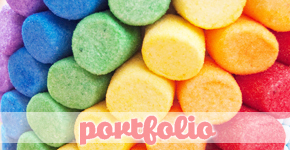 I am soooo thrilled to share my 1st project I’ve made for KRAFTJet-Puffed marsmallows. I created a 4th of July dessert table with a fluffy twist! WE’RE JOINING THE KRAFT JET-PUFFED MARSHMALLOWS TEAM!!! Pinching. Pinching. Still pinching myself and not waking up. Wow, this is really happening. It’s not a dream!! I am jumping with excitement over here! After months and months of holding it in, I am thrilled to finally be able to tell you all that The Marshmallow Studio is being sponsored byKRAFT Jet-Puffed marshmallows. This is HUGE!! Jet-Puffed being the #1 marshmallow manufacturer in the United States asked me to join their team?!?!? They sure did Let me tell ya, it’s a beautiful feeling to know that the marshmallow brand I love and use the most actually admires what I create and think so highly of me as to bring me on board as their “digital spokesperson”. I feel soo honored and blessed!! I have joined their team as the new Community Manager. 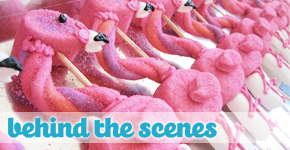 You’ll soon find me creating amazing marshmallow masterpieces, sharing recipes, videos and more on the Jet-Puffed Facebook page and other social media outlets such as Pinterest and Website. Can’t disclose too much yet but I can tell you we are working on lots of really fun and innovative things that I’m sure you’ll love so stay tunned for those. I will keep you informed of what’s coming up so you don’t miss a thing. What better way to make this announcement than with marshmallows? I wanted to make this announcement extra special so I ‘mallorized the JET-PUFFED logo. We used a 48″ X 36″ board, mini marshmallows, MallowBits and StackerMallows. My husband and I had actually had a pretty good time making this together! Since most of the marshmallows we use are KRAFT Jet-Puffed, I thought it’d be a good idea to share with them what we use them for. So I posted a photo of our TMS original Cupcake Marshmallow Pops on their wall and thought nothing would come of it. A couple of days later, I woke up to see over 300 new Facebook fans, a full inbox, and tons of sweet comments on my photo. Kraft had shared my photo with their 777,880 (at the time) fans and we instantly had gone viral!